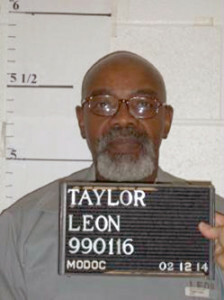 Missouri has carried out the execution of 56-year-old Leon Taylor, who was sentenced to death in 1999 for the murder in April 1994 of Robert Newton, the attendant at an Independence convenience store he had just robbed of $400. He received a lethal dose of pentobarbital at 12:14 and appeared to stop breathing less than two minutes later, at the Eastern Reception, Diagnostic & Correctional Center in Bonne Terre. His official time of death was 12:22. The U.S. Supreme Court on Tuesday denied appeals for a stay of execution. Governor Jay Nixon then denied an appeal for clemency for Taylor. Taylor is the ninth man Missouri has executed this year and the 11th since November, 2013. Only in 1999 has Missouri carried out that many executions in a year. Prosecutors sought the death penalty against Taylor for several of what Missouri terms, “aggravating circumstances,” including that the murder was connected to a robbery, and because Taylor committed the murder while Newton was holding the hand of his then 8-year-old stepdaughter, Sarah Yates. Taylor was convicted of murder by one jury who was unable to agree on his punishment, so the judge imposed the death sentence. That sentence was reversed on appeal, but at the subsequent trial the jury found Taylor guilty and sentenced him to death. Yates testified against Taylor both times. Taylor’s attorneys asked the U.S. Supreme Court to halt his execution based on a 2002 federal court ruling that said judges could not impose a death sentence when jurors fail to agree on one. That ruling applied retroactively, and Taylor’s attorneys argued that his was the only case of someone for whom a judge had imposed a death sentence that was not later commuted to life, making his circumstance unusual. His attorney also argued that the execution should not be carried out because the jury that sentenced him to death was all white. Six blacks were said to have been dismissed from serving as jurors by the prosecutor in the 1999 case, while the jury that was unable to agree on a death sentence had been racially mixed. Taylor was scheduled to be executed in September but the Supreme Court lifted that execution warrant when his attorneys said they would be unable to work on his case at that time. Instead, Earl Ringo, Junior, was executed September 10 for 1998 the murders of a Columbia restaurant manager and a delivery driver.